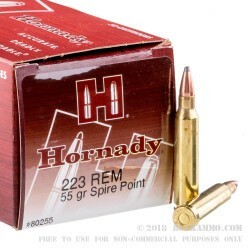 A very nice hunting round for medium game and varmint hunting from Hornady, with a more traditional take on the modern .223 Remington round. The “spire point” soft point projectile is suitable where you can still shoot lead, but you’ll need to check for big game to ensure it is sufficiently within your state’s regulations for larger game. The 55 grain projectile is soft tipped and features a copper jacket to reduce fouling and provide adequate expansion for hunting situations. It is matched to powder that gives it a very consistent flight path with a deviation at 100 yards from the bore exit of -1.50” to 1.50 inches. The velocity at muzzle exit is a generous 3240 fps and it delivers 1280 ft. lbs of energy at the bore too. These numbers put it into the top tier for performance without having ridiculously hot powder behind the projectile. 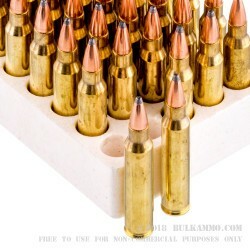 This round is also a very good candidate for reasonably price ammunition for home defense if you prefer the solid traditional reliability of the soft point bullets in small caliber offerings. 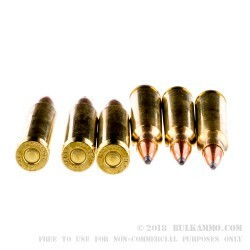 The ballistics are on par with the best self defense hollow points and the proven 50 grain bullet is a good projectile for moderate range home defense purposes. Q: Is this ammo allowed in indoor gun ranges? A: Thank you for your question! It is important to note that most shooting ranges are private property and as such the owners are able to make whatever restrictions they see fit. 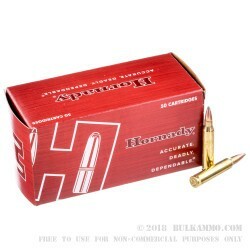 While we see no reason why a range would not allow these Hornady rounds to be used, it is important to contact your local range before purchase to confirm if they have any restrictions.